Which are the lucky and favourable colours for you? The lucky & favourable colours for you? Thank you for trusting in my astrological services and providing me the opportunity to analyze your birth chart. I have received the following information from you and have used the same as a basis for all the mathematical calculations for casting your horoscope and interpreting the same to the best of my ability. 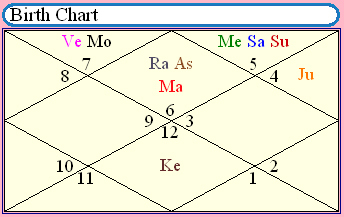 As per the above birth-data, your Vedic (sidereal) ascendant is Virgo ('Kanya'), the Vedic Moon sign ('Rashi') is Libra ('Tula') and Janma-nakshatra (birth-star) is Swaati (pada-2). Please be reminded that do not confuse it with your tropical (Western) ascendant and tropical Moon-sign, which may be same or a sign higher (in your case, tropical ascendant is 'Libra'). Through this report, I will measure suitability of various colours for you, based on astrological signatures present in your horoscope. It may be an extremely helpful document for you while making decisions about colours in your home, office, car and even your personal apparel etc. Besides that, you should utilize your best colours in your office stationary, like letter heads and business cards. Your company logo should also be designed in one of your favourable colours. This report will help you in keeping synched with your best astral vibrations. The following report present the results divided into seven categories. Therefore, it will be useful for you to understand the underlying principles applied to create these categories. The very basis of the categorization is the "Overall functional beneficence" of various planets in your birth-chart. To calculate the Overall Functional Beneficence (OFB) values of various planets, first of all, the functional benefic and functional malefic planets are identified in your horoscope, as per the tenets of sage Parashara. Thereafter, the principles told in various other streams of Vedic Jyotish, to measure the exact benefic or malefic nature of the nine planets in the native's horoscope, are also applied to fine tune the results. The formula basically takes into cognizance the important parameters like lordship of houses, exaltation, dignity, combustion, shadbala, Natal Ashtakvarga status of planets, benefic and afflictive aspects thereon etc., with whom and where there are posited, nature of posited Nakshatra, etc, to finally arrive at "Overall Functional Beneficence" (OFB) values for all of the 9 planets. These 'OFB values' are calculated in 'Percentage terms'. Thus, the minimum can be 0% and maximum can be 100%. In between, there may be seven categories, as named below. The span of each category is 14.28%. The 'Excellent', 'Good' and 'Fair' categories indicate positive, favourable and desirable colours - in descending order respectively. The 'Average' represents moderate colours. The 'Inadequate', 'Poor' or 'Worst' categories indicate negative, unfavourable and undesirable colours in ascending order. Thus, "Excellent" is most desirable and "Worst" is most undesirable category. You should observe extreme prudence and caution with 'Poor' and 'Worst' categories. In a horoscope, there may be more than one planet in a particular category. In the same way, it is not necessary that all 7 categories are represented in your horoscope. Some categories might remain vacant. Here-in-below is the comprehensive report which identifies suitability of various colours for you, based on astrological signatures present in your birth-chart. Each colour is signified by one or more planets. This report will give you guidance about the colours - which you should (or should not) use. You should normally select the colours which are categorized as 'Excellent' or 'Good'. Grass Green, Dark Green, Parrot Green, Yellowish Green, Beige, Light Bluish Grey Or Slate Color, Dove, Mixture Of White And Pale Blue, Spotted Mixtures, Many Colours Together, Turmeric Yellow, Golden Yellow, Earthy Yellow-orange, Mongoose Brown, Ochre, Violet, Royal Purple, Some Blends Of Red And Indigo. Speckless White, Prismatic/crystalline White (transparent), Royal Blue, Sky Blue, Pale Green, Greenish Blue, Pink, Lemon Yellow, Turquoise, Azure, Variegated Colors (bright And Shining), Spotted, 'art Tints' In General. Snow White, Off White Or Pale White, Pale Yellow, Opalescent, Pearl, And Iridescent Hues, Silvery Gray, Soft Sea-green, Straw-yellow, All Cream Colours (like - Jasmine White, Magnolia, Barley White, Orchid White, Almond White, Vanilla White Etc), Smokey Black And Hazy Dark Shades. Copper, Deeper Shades Of Yellow (yellow-brown Or Burnt Yellow), Tanned Orange, Golden, Saffron. Gloomy Black, Dark Bright Brown, Navy Blue, Very Dark Blue (blackish Blue), Blackish Indigo, Purple, Dark Chocolate, Dark Grey, Dark Slate, All Dull Colours, Darkest Shades Of All The Colours, Smokey Brown, Bluish Like Smoke, Hazy Red. Fiery And Blood-red, Bright-red, Scarlet, Carmine, Crimson, Magenta, Claret, Deep Orange, Reddish-brown, And All Angry Shades. The above Colours, categorized as 'Poor' and 'Worst', should be avoided by you as far as possible. These colours will be harmful to your health and general well-being. They may cause obstacles, delays and unexpected problems in your life. May Almighty's Grace shine on you ! !